Featured as Best New Games on iTunes. **Limited time free to help you polish math skills to be ready for Final exam! ** Mathema helps children master the building blocks of addition, subtraction, multiplication, and division. The game is perfect for students in grades 2 to grade 6, or anyone who wants to improve their knowledge in math. The 2 featured game modes, Addition and Subtraction, are designed specifically to help children practice the new common core version of Math. These modes promote development of mental strategies that will improve all round mathematic ability. Instead of mechanical computation, the Common Core standard tries to help children understand the concept behind the math and develop a number sense. 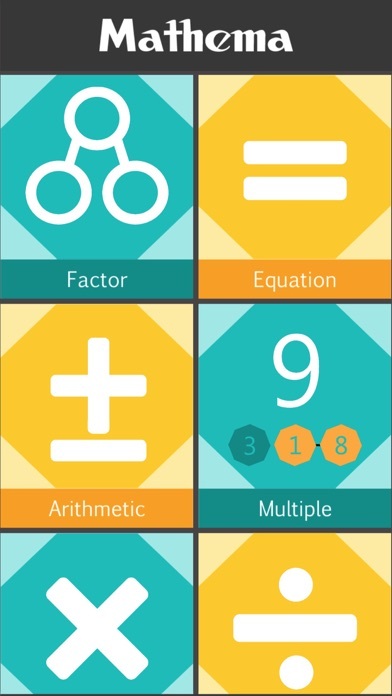 Mathema’s main purpose is to help players practice arithmetic in such a way that align with the common core way of thinking. Overview Addition Mode - This mode is designed around Common Core. In this mode, a 2 digit addition question is presented. For example, 37+18. To get the answer, the child can first break down 18 into 3 and 15. Adding the 3 to 37 will bring it to 40. The question then become 40+15. Practicing this type of operation fosters the mental process of breaking down numbers in addition operation. Subtraction Mode - This mode is also designed with Common Core in mind. In this mode, a 2 digit subtraction question is presented. For example 80-67. 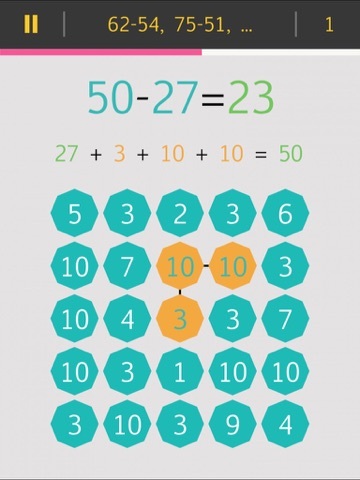 However instead of simply executing the computation, the child is presented with an addition problem of “67+ _ = 80” instead; that is, the child will need to think about what adds to 67 that will equate to 80. The Addition Mode and the Subtraction Mode helps children understand how numbers can be broken down into units of smaller numbers. Besides the Addition Mode and the Subtraction Mode, there are 6 additional modes that children can work on. Multiplication Mode - Practice multiplication within 100. 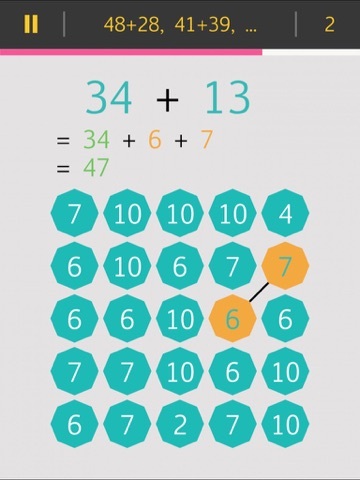 This mode helps children recall basic arithmetic facts quickly. Division Mode - Given a number between 100 and 1000, the child needs to divide the number down to a prime number to score. Arithmetic Mode - Try to add to a target number while the operator alternates between plus and minus. A challenging exercise for players of all ages. Equation Mode - The child needs to form a valid equation with the given grid of numbers. This mode helps the child develop a good sense of relationship between numbers. 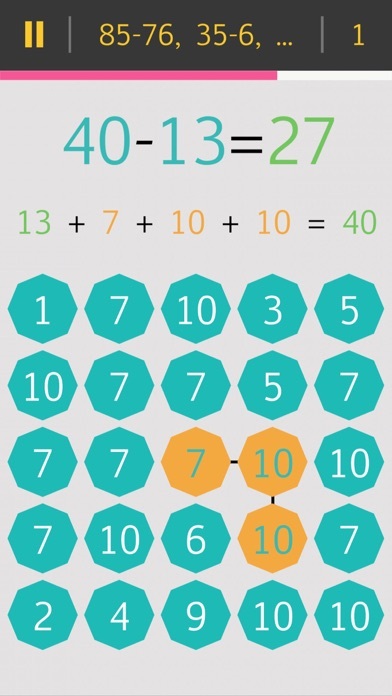 Multiple Mode - form numbers that are multiples of the target numbers Factors Mode - find as many factors as possible for a given number Mathema presents a fun solution for grade school children to increase their knowledge in math and improve their arithmetic fluency. Mathema’s exercises are simple and straightforward. 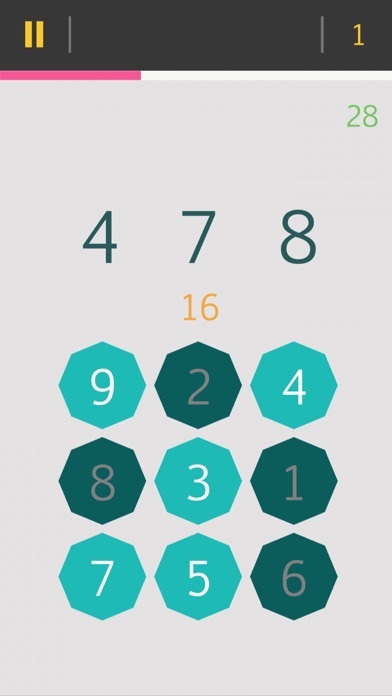 Mathema offers flexibility to players with multiple difficulty levels, and different time modes. All players will be able to find the right level that’s suitable for them. As their skills develop, they can move on to higher difficulty levels for a bigger challenge. Time spent on Mathema will be well-rewarded. Features - Beautiful interface - Includes all 4 operations - Multiple difficulty levels - Simple and straightforward - Swipe numbers to solve the question - Beat the time limit and survive for as long as you can! 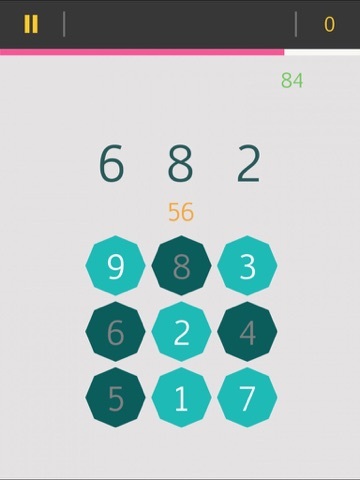 - Pure mathematical fun!